NS-023 Pink is a light transparent bright pink. It is atmospherically stable meaning it can be worked in any flame without the colour being changed. It is also resistant to excessive heat, and can take a lot of abuse. Because NS-023 Pink washes out when thinned, most regard this colour as one for solely sculpture. Surprisingly another great role for NS-023 Pink and other transparent colours is use as overlay colours. 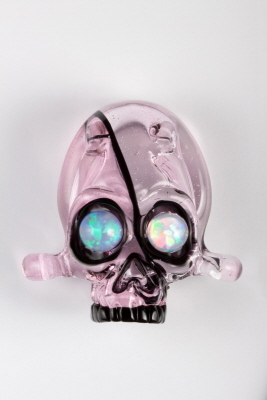 NS-023 Pink looks great over NS-026 Double Amber/Purple, NS-045 Blue Moon, and many others. By using even a thin coating of Pink, a striking colour can be transformed into an entirely new shade.